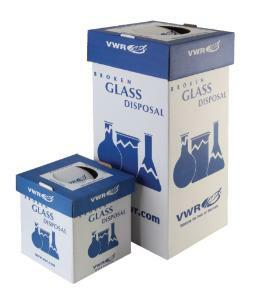 These handy disposal boxes keep broken glass contained and maximize safety in your lab or classroom. Each receptacle includes a 2 mm thick polypropylene bag sturdy enough to hold broken glass fragments and spilled liquids. Pull the safety cap into place when the box is full for easy clean up and dispose of the entire unit.